Otter Lee Brave. My first thought was, “This is such an adorable cover. The otters are just the sweetest little fellows. I’m sure this will be an cute story about otters.” Then, I said the title again – Otter Lee Brave, Utter Lee Brave, Utterly Brave. Odd, yet interesting. I am hooked, and I have to read this book, and I feel sure 4th graders will as well. 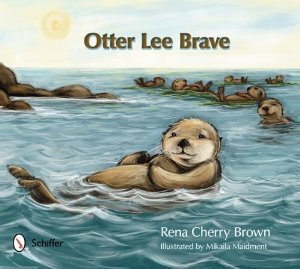 Upon reading the story, it becomes very evident that Otter Lee Brave is so much more than just a sweet story about cute creatures. Rena Cherry Brown creates several plot points that will teach the reader many lessons. Throughout the story, Lee learns to be brave in all circumstances. First, he tries diving to the bottom of the bay for the first time, with his mom gently encouraging him. Next, Lee learns how to comfort himself in times of trouble. When Lee is picked up and taken to an aquarium, he learns to adapt to the situation. While Lee is bullied by a large otter in the aquarium, he is also adopted by an older female, learning the good and bad of characters in life. An earthquake causes the aquarium to bust open and all the otters are swept into the bay. While they are not equipped with open water survival skills, Lee teaches them how to hold on to kelp to prevent them from floating away. There he learns to be a leader. Even when the bully is in trouble, and Lee is the only one who knows and can save him, Lee considers the actions he could take and ultimately decides to save the bully otter learning bravery. And, like all good otter stories, Lee stays in the bay and makes a connection with a female otter – and they live happily every after I assume. He is Otter Lee Brave. The story is interesting, but the illustrations are fabulous. Mikaila Maidment uses each page to bring life to the book. You feel the tenderness of motherly love. You feel the security a kelp bed can give and the sadness of the loss of a loved one. You feel the anxiousness of a new environment. You feel the weakness of being bullied. You feel the fear of the unknown. You feel the hope for a future. You feel young love at the end. All of these feelings come from the amazing artwork of Maidment. Within the story line, readers gain small facts about the otter world, such as what their environment is like, what their diet consists of, and what obstacles and predators they must avoid. The last page contains a list of “Otter Facts.” The story, lessons learned, facts and illustrations all combine for an increased level of reading comprehension for readers of all ages. What would it be like to talk to insects? In this Victorian-era tale, we meet ten-year-old Henri Bell, a British boy who discovers this special ability while spending the summer with his great aunt in America. Talking to six-legged creatures is the only bright spot in Henri’s life as his mother has traveled to the other side of the world to search for his missing father. Even though Henri’s great aunt is kind, her neighbor, Mrs. Black, unnerves him with her creepy stares, peculiar behavior, and cruelty toward insects. A visit to the circus changes Henri’s life forever. After attending Maestro Antonio’s Flying Flea Circus, Henri uses his new communication skills to transform the act into something much better and receives an invitation to be Maestro’s assistant. Wanting to get away from Mrs. Black, Henri runs away with the circus. On the road, he forms a familial bond with many of the performers except for the strange fortuneteller, Madame Noir. Later, he learns that Madame Noir is, in fact, the fearsome Mrs. Black. Why is she following him? Turns out Henri and his nemesis have something in common: an interest in the elusive Goliathus Hercules, a supposed gigantic beetle that has never been captured. 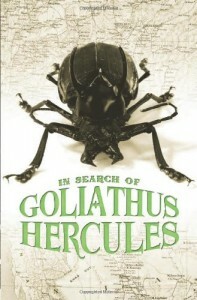 Henri’s father was last searching for this beetle before he disappeared and Henri spends the next three years of his life on a worldwide quest to find the creature and hopefully get some answers. Meanwhile, his body endures a strange physical transformation – he is slowly morphing into an insect. Why is this happening? This is where the plot stumbles. Too many unanswered questions and convenient plot points (suddenly Henri’s whole entourage can talk insect – huh?) left this reviewer completely “bugged.” Fourth grade readers may be more forgiving, however, as the characters are likeable; the talking insects are amusing; and there’s an exciting duel plus a surprise twist at the end. Fourth graders may also enjoy the author’s website (www.jenniferangus.com), which includes a link to folklore stories, facts, games, and other insect-related literature. Jemmy Button is a delightful picture book based on the stories of Jemmy Button, a native boy from Tierra del Fuego. The story depicts the life of the young boy who was taken from his native land to England in the early 1800’s where he was educated with the hopes that he could then educate his native people upon his return. Readers of all ages will delight in the story and the 4th grade level reader will master the text without difficulty along with developing an appreciation for the illustrations. This is one of those books that appears simple in text for younger readers yet offers many levels of meaning for older reader when the full scope of what the character experienced is fully understood. Those deeper meanings will give teachers many opportunities for discussions on the emotions their students would experience if placed in the same situation. Classroom activities can include group work allowing students to make up a new scenario for current times that includes having the 4th grade student being uprooted from everything he or she knows and placed in a completely new environment. Including Jemmy Button as part of reading, writing, and comprehension lesson for the 4th grader will also allow the teacher or parent to include character development, environmental affects, and family relationships when discussing this picture book. The book leaves the reader connected to the character in a deeper way than many novels accomplish and those types of books and characters come few and far between. Teachers and parents who overlook adding this picture book to their libraries are missing a great opportunity to give readers an emotional experience and a love of story that most will not forget. Wisdom’s life is a remarkable story, at times touching and suspenseful, but ultimately inspiring. Survival is hard enough for a Laysan Albatross. 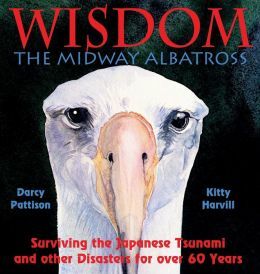 Wisdom was one of many chicks born that year on Midway Atoll, but few survived long enough to fly. That was the first hurdle for this little chick. She took to the skies, flying and catching food from the sea for years. She endured predators, such as sharks and natural phenomenon, such as tsunami, but returned to Midway in 1956. That year she mated and laid an egg. We know that because a research scientist caught her and banded her that year. Through this study, Wisdom’s life is documented. Not only did she endure the normal circumstances that threaten birds, now she faced death from manmade causes. Many birds became victims of eating plastic that appeared in the ocean. Some got caught in longline fishing lines and were trapped. When her band was checked in 2002, scientists were so impressed by her longevity that they gave her a name: Wisdom. They documented her laying an egg each year from 2008 through 2011. But that year, not only did a big storm hit, a tsunami flooded the island. Many albatrosses were killed. Scientists worried about Wisdom and her chick. For nearly ten days, no one saw her until they finally spotted her feeding her chick safe in their nest. Readers can’t help but cheer for the tough, beautiful bird. Students could listen and list the different threats to Wisdom’s survival as a literacy activity. It would make a great class read aloud for both environmental and animal units. The soft watercolor illustrations are a lovely accompaniment to the text. There is a book trailer on the author’s website which will be a quick introduction to the book: (http://albatross.darcypattison.com/). The U. S. Fish and Wildlife service has frequent “Wisdom” updates at: (http://www.fws.gov/midway/whatsnew.html). Explosions, lightening, secrets… what reader on the fourth grade level could resist a book that gives recipes for causing, creating, or discovering all that? Top that fun with a bunch of candy – literally – and Candy Experiments is sure to please! Science fanatics are sure to gobble up this book. In bright candy-colors, this Candy Experiments offers 70 kid-friendly experiments each conducted with – you guessed it – candy. Each test begins with a short teaser, such as, “Can you make marshmallows dance without touching them?” All experiments include basic information in three consistent subheadings: what you need, what to do, what’s happening. This organized presentation will help readers with comprehension of the material. Skill levels are labeled: easy, medium, advanced or get a grown up. Most of the required supplies and equipment are easy-to-access candy or household materials. A few experiments, however, rely on specialized equipment such as a FoodSaver vacuum sealer. The experiments themselves address a wide variety of science concepts, including density, solubility, and acidity. While a few of the experiments will be too simple to challenge readers on the fourth grade level (melting candy in water) and some feel a bit contrived (reading food labels to see how much “candy” they include), most of the experiments will appeal to candy-happy kids. The scientific explanations are presented in a chatty voice and focus on comprehension. Candy Experiments contains content rich vocabulary (such as molecule, crystals, geologist, air pressure, and even chromatography), but without definition. Although there is a useful index, no glossary is included. 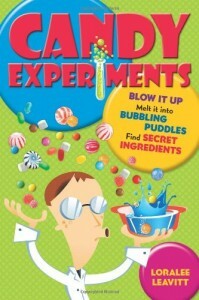 Candy Experiments is a cross-over book which will have appeal in both the classroom and the home. The depth and diversity of science concepts and skills demonstrated makes it a good compliment to school curriculum; yet it is so much fun that children will also read it for pleasure. The book provides an engaging example of expository informative text and could be used by teachers implementing the Common Core State Standards. If used with small groups of students, the step-by-step nature of the text lends itself to read aloud practice. Candy Experiments is a clever combination of fun and learning. Readers will be hooked by melting, bubbling, or bursting their favorite treat while discovering important scientific concepts! In an age when everyone has at least five email addresses and many people have a personal blogs, some applications and websites continue to outshine all the others. Tumblr is right up there with Facebook and Microsoft in name recognition, at least among those familiar with coding. Tumblr is described as a short-form blog in which the owner can post pictures, chats, or songs – more than Twitter and less than Facebook. 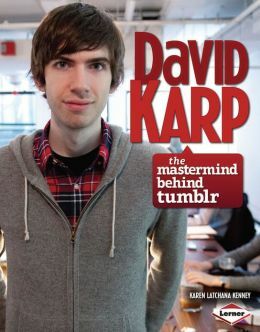 Even as a child, David Karp, Tumblr’s founder, showed amazing talent for programming and for coming up with innovative ideas. He worked as an intern at the age of fourteen and had his first real job at UrbanBaby at sixteen. Because of his age, he avoided contact with those he worked with and even secretly worked for a New York company from Tokyo for a while. With the money David made at UrbanBaby, he was able to start his own company, Davidville. Tumblr was launched as part of this company in February 2007. Today, with over 50 billion entries, it’s grown into a major force on the internet. Written at a fourth grade reading level, the text chronicles the career of a man who was very young when he started taking the world by storm. That fact alone should appeal to kids. This is a part of series called “Gateway Biographies,” with an interesting collection of inspiring people. For added value, the author includes a table of contents, timeline, source notes, bibliography, web sources, and index. Kids curious about the internet can easily create reading activities with the sources listed and a little supervision. Despite some effort to provide culturally diverse education for students, information on Native Americans is largely ignored or just plain nonexistent. In this ambitious text, the author provides an excellent overview and beginning point for learning about the first North Americans. Each page uses graphics to provide information and should capture the attention of fourth graders with numerous charts, graphs, and timelines. Naturally, the author begins with where the people came from and when. He gives a great explanation of the land bridge called Beringia and how and when it disappeared. He also shows that many groups used shoreline exploration rather than overland routes for migration. The various climate zones in which the groups lived and the names of the tribes are discussed, as well as the types of shelters they constructed, the community structures and the food they ate. A particularly striking graphic of the many uses for the bison is shown. 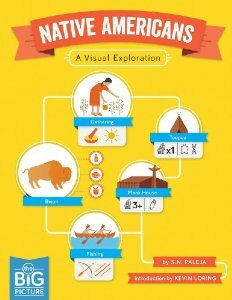 The reader learns about environmental impact, the diverse languages of Native Americans, their spiritual beliefs, and their inventions. When Europeans entered the picture, looking for riches, the lives of Native Americans changed drastically. The author explores their current situation and possible future. With all the infographics presented, the author implicitly suggests further reading activities, such as drawing more detailed maps over smaller regions. This is a dispassionate treatment of the overall subject, which affords a great opportunity to learn the true facts. The extensive bibliography and index make it easy for the curious reader to continue study of the topics introduced. The publisher’s website (www.annickpress.com) has more about the book, the author, and the publisher. Another lively mystery with the Alden family. The Alden children, Henry, Jessie, Violet and Benny, could have still been living in their boxcar but long ago Grandfather took them in. Now they have a habit of solving mysteries everywhere they go. This summer, Grandfather took them to New Jersey to visit Mr. Hanson, one of his good friends. Mr. Hanson bought an amusement pier along the New Jersey shore. He said he always wanted to own one. His children, Wendy and Will, were not so happy. They missed their friends in Colorado. Even worse, pranks and practical jokes were ruining business at Mr. Hanson’s amusement pier. There are even rumors that the rides at the pier are not safe. Each time one of the Alden children help repair or clean up after the pranks, they gather one more clue about what is really going on. They noticed spatters of paint on Wendy’s shoes like the red paint used for mean messages. There is the angry Mrs. Reddy, who used to own the pier and she complains about how badly Mr. Hanson is running the pier. There is Mr. Cooke, who owns all the other amusement piers on the shore and wants this one, too. 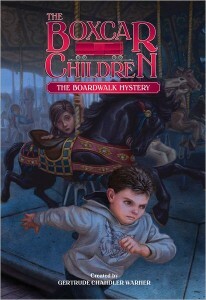 The Alden children each have their own talent, especially Benny, whose talent is to get into trouble. One by one they put the clues together and see how all those people played a part in the pranks. Violet has an idea that might save the pier if they can stop the pranks. 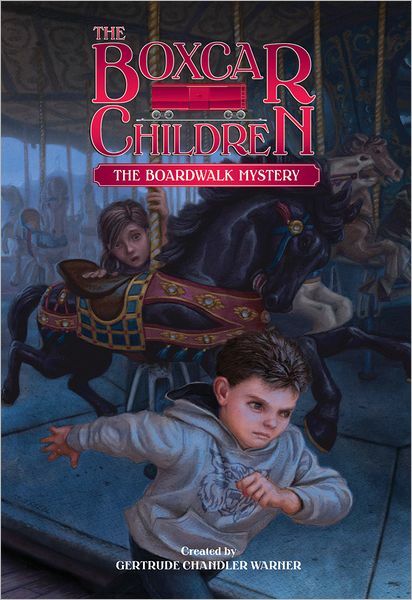 This mystery is the right length and complexity to intrigue young middle grade readers. The clues are laid out well, hinting at the underlying motivation of the characters. These updated stories use the familiar characters to engage a new generation of readers. The reading level is a solid fourth grade and it is a good length for a class read aloud. Use early in the fourth grade year. Have the students keep a list of clues like the Alden children do as a reading worksheet and see who can solve the mystery first. The story of Dave is both inspirational and tragic, set in a period of time that no one should be allowed to forget. Through Etched in Clay, Andrea Cheng masterfully presents a piece of this history to readers at the fourth grade level and above. Born in 1801, the courageous man at the heart of this story became known as “Dave”” after he was purchased at a slave auction when he was seventeen. At first, Dave was responsible for dredging clay from the bottom of the river for the Pottersville Stoneware Manufactory in South Carolina. Before long, he took to the wheel and became one of the most accomplished potters in the region. Etched in Clay follows Dave’s life through many hardships as he is bought and sold four times, has two wives taken from him, and then loses his leg after being hit by a train. Throughout all of this, Dave learns to read and then write, despite laws prohibiting slave literacy. He risks being beaten, maimed or even killed to teach other slaves to read and refuses to be silenced – leaving evidence of his bravery by signing his name and the date on his pots, and often etching them with words and poems. Told from multiple points of view in free verse poems, Andrea Cheng weaves together the few known facts of Dave’s life with imagined details to form a compelling narrative. This is complimented by sparse wood cuts and an afterword that provides additional information on Dave, life in South Carolina after the Civil War, and Edgefield pottery. Today, Dave’s pots are prized by collectors and housed in museums. He has been the subject of other books, most notably Dave the Potter, a Caldecott Honor winning picture book written by Laban Carrick Hill and illustrated by Bryan Collier. Etched in Clay digs deeper into his story, with an intense richness of time and place, packaged for an older audience. 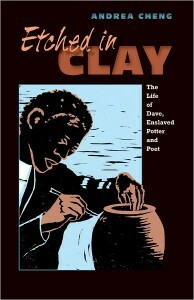 It presents a jumping off point for deeper discussion about slavery, the civil war, poetry, and pottery while at the same time challenging comprehension as readers reach for their dictionary – to understand lamentable, disenfranchised, magnanimous, sagacity, concatenation– and attempt see the world through the eyes of Dave. 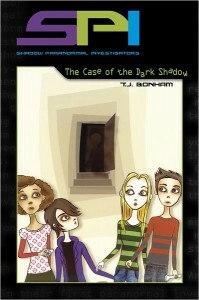 SPI The Case of the Dark Shadow is an intriguing story for 4th through 6th graders interested in mystery. The book offers the 4th grade reader some challenging language and an unusual plot, but older readers should have no problem with the language and comprehension of this paranormal mystery. The story grabs the reader from the first chapter by describing emotions common to students who have experienced loss, change, and the fear of starting at a new school. This will offer teachers many opportunities to discuss coping mechanisms for students. The rest of the story is full of mystery and fun as the character and her friends battle a sinister dark shadow that threatens to harm a ghost hunter and her family. Interwoven in the mystery of the dark shadow is the emotional side of living with a parent deployed during war, another real life situation that kids this age are living with. A book for middle grade readers that includes real life situations that engage the reader will only serve to encourage students to keep reading, but a book that also includes “outside the box” topics, like ghosts and the paranormal, can broaden their scope of interest and be just what the teacher ordered for the reluctant reader. Teachers can use this as a classroom book read aloud or together because of the topic, the mystery, and the overall interest to boys or girls. SPI would be a great addition to the 4th to 6th grade classroom library. The book can be used as an adjunct to reading advancement, comprehension, and writing lessons for students in these grades, making it useful for teachers working with state reading guidelines. And books that have excellent plots and story lines are always appreciated by teachers who prepare students for state testing involving reading passages for comprehension and understanding.